In our last post we discussed briefly the main reasons why Switzerland is such a great place for children to study. Today, we delve a little deeper into the academic landscape of Brillantmont's home country. This is another extract from Why Study in Switzerland? – our latest ebook now available as a free download. According to the Swiss Federal Statistics Office, there are approximately 730 schools offering upper secondary education in Switzerland, 240 of which are private – that’s around 30 per cent. Compare this to the UK where there are around 2,500 independent secondary schools out of 24,600 2, putting the figure closer to just 10 per cent. Students from over 100 different nations currently study in private schools in Switzerland and can choose to follow the British A Level programme, the American High School, the International Baccalaureate, the German Abitur, the French Baccalaureate or the Swiss Maturité, depending on where they go. 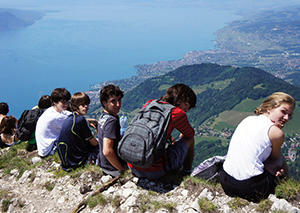 When it comes to higher education, in Brillantmont’s home city of Lausanne alone, there is a wealth of options for students looking to continue their learning beyond secondary level. These include leading technical universities such as Ecole polytechnique Fédérale de Lausanne (EPFL), and the world-famous hospitality schools like École Hôtelière de Lausanne (EHL) that have produced many leading industry figures, all ranked highly on the world stage. In Switzerland as a whole, according to the Financial Times the University of St Gallen in Switzerland has been the top business school from which to gain a masters in management for the last three years running. Graduate employment from its management programme is at 100% and the average graduate salary is at $80,081 p.a., giving the university the highest overall value – some 70 places ahead of the London School of Economics (LSE). all over the world. Family atmosphere, passionate teachers, kind staff, students of various nationalities, location... all of these factors are important for my daughter to continue to stay and study in Switzerland," says Reiko, a current Brillantmont parent from Japan. Read more from Reiko and other Brillantmont parents, students and alumni in Why Study in Switzerland? – our new ebook for 2014. In it we explore the culture, geography and academics of Switzerland, also told from the perspective of the people that know it best. Happy reading!